But previous outsourcing deals by councils have only seen social work run by local authority-owned trading companies or not-for-profit social enterprises spun out of social services departments. Bath and North East Somerset council has said a clause in the Virgin deal will require any financial surplus to be reinvested in services. Since 2011 Bath’s adult social care services have been run by Sirona Care, a not-for-profit social enterprise, after the council opted to outsource provision. Virgin Care was selected over a rival bid from a consortium of local services led by Sirona Care. The council and NHS commissioners said the Virgin bid at least matched the consortium in every individual area, and there was a “significant” final difference in the total scores. A Bath council spokesman said arrangements for transferring staff, including social workers, from Sirona to Virgin Care would be worked out over coming months. “But we can confirm that anyone transferring to another organisation under TUPE regulations will retain their existing terms and conditions, pay, and pension,” he added. The Virgin deal has sparked criticism from unions, social work leaders and unions. Earlier this week Lewis Carson from Unison said the union’s members were opposed to a profit-making firm taking over services. “We’re fighting to oppose the contract. We have concerns about what this means for staff conditions and service delivery. Why do we think the worst. Private fostering agencies offer a good service. Adult care in some places needs a good overhaul. I pose the question why is local authority better than private.? Could private organisations offer better motivational deals for hard workers and weed out the colleagues we all complain about. Trump at the beginning of the week now this! what an awful week! It is well known that TUPE is not worth the paper it is written on. Ideology plays some part in awarding this contract, that everything should be run by the private sector and that profit is good. It is clearly the case that if there is a good business case for cutting staff terms and conditions of employment, Virgin will be able to do this. Staff should be very concerned here about the future of both terms and conditions and pensions. I personally would not want to work for ultra capitalist Richard Branson, I would sooner be unemployed. Staff are of course free to seek other employment and looking at Virgin, being self employed looks like a better deal. Hope as may of you as possible find alternative employers. Branson should never be allowed anywhere near public services. Shame on the Tory rubbish that voted for this. Do not assume that remaining in the public sector does anything to protect worker terms and conditions of service. My local authority has frozen pay and increments year upon year since the financial crisis and passed management functions, such as supervision, further and further down the hierarchy without financial compensation. The NHS trust my wife works for has a known policy of reducing the grades of all staff by stealth – that is recruiting posts to a lower grade with the same responsibilities and doing away with higher grades that were based on skill and experience as well as responsibility. No one who has been in social work or health for any length of time can have failed to notice the huge proportional increase in unqualified ‘support’ staff, who carry out what used to be social work or nursing functions for far less pay and often with no opportunity to progress through secondment to professional training. Public Sector organisations have been attacking pay and conditions, as well as professional standards, for many years so let’s not fool ourselves on this one. Is this a signal for the beginning of the end of statutory services – will children’s services be next? Very concerning! Had Unison kept a better eye on the previous administration there would be no need for this. Instead of decrying Private companies making a profit everyone needs to concentrate more on the quality of Care etc. provided. Now that CQC and others are doing more thorough inspections of all Providers we are beginning to get more unbiased reporting which is clearly showing that the Public Authorities are in need of assistance from the Private Sector. Or do you mean PWC who got paid I think 2m for telling a council to charge more for services? See recent edition of Private Eye. Good. This might be an eye opener for other councils to pull their finger out and sort out there own houses. As article says services were already out sourced so why say this is the end? It has already happened. The waste of resources and dead wood in charities and local councils needs to be chopped out. “Job for life” mentality in these places is sickening with no one having the back bone to sack incompetent or underachieving lazy employees. Do you job properly with professionalism and show some loyalty and you will be fine. Yes people always have choice of where they work. Would be great if as an employer we could say we have now spent x thousands on your training you now have to work for us for x years. Don’t fear change embrace it as it will always be happening. Well Julie, I am not a Tory but I am fed up of the mismanagement and the increase in administration and meeting targets that get in the way of good practice. I have seen good private fostering organisations , care agencies, provide really good care. If a private organisation can keep good practice at its core and reward its staff for hard work I am all for it. Oh Bert, how very New Labour of you! There is no genius at play- they cut pay and conditions and cream this off as a profit. They are not the efficient machines you imagine- take my local children’s centre- it has changed provider three times in the last four years. Each time it gets new shiny signs. Meanwhile the majority staff are on temporary agency contacts- its a mare and certainly not the picture that you present. Re- Job for life mentality- yes lets put everyone on insecure contracts- i’m sure that will achieve wonders. Re- ‘Do you job properly with professionalism and show some loyalty and you will be fine’. How naïve you are. They have to make a profit. I know from experience that very often these companies make decisions without knowing the slightest thing about ‘Bob who works on floor two’. 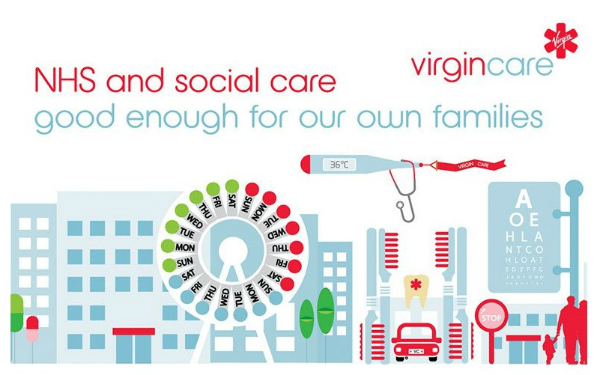 Virgin Care to take over statutory Bath and NE Somerset adults social services commitments April 2017. The chaotic state of care in the community surely cannot be more clearly illuminated than by the takeover of three statutory services by a privately owned profit-making firm. Previous outsourcing deals have taken place but only by local authority owned trading companies or not-for-profit social enterprises. Handing policy and implementation of services for people with learning disabilities to local authorities in the first place has been an unmitigated disaster. LGAs with the willing cooperation of major charitable organisations and the unions have dragged what was a successful evolutionary national development policy for these people and their carers from a sound and promising position in the1980s to what over the past 30 years has become and increasing painful spiral of decline and policy fiasco. What hope can there be that a profit making company can turn this disaster around when the national policy regarding appropriate services for people with learning disabilities remains unresolved? All those who should have put the interests of this most vulnerable section of our community foremost have betrayed them abysmally by failing to have vital issues concerning their welfare debated objectively in the public domain. These people need their problems to dealt with and formulated and implemented by a specialised department overseen by experienced humanitarian professionals. This was proving successful in the 1980s – although few will be aware of this as the academics have conveniently written this early success story out of history. It will require a dedicated Minister to remedy the current situation but it will be only by engaging a greater level of public support that there be the slightest hope that this prospect could materialise. Carers must now rely on the leading charitable organisations recognising the seriousness of the current situation and focus on trying to do a great deal more about it. I totally agree. I am so fed up covering for those staff always on sick, who refuse to pick up work, disappear early and complain all the time. As I said in an earlier post let’s be managed and rewarded for hard work. What makes you think a private company will be any better? Nepotism is rife in the private sector. The grass is not always greener. Bert as I said you are clearly part of this Tory rubbish. I totally object to you calling public sector staff dead wood. You Sir are a Tory Troll, run along now its way past your bed time. If people cared to look at the number of redundancies which have taken place since 2010, they would realise that there is no “dead wood” left to get rid of. Cuts to budgets have meant constant closures or cuts to services. No one working for a local authority is under the illusion that they have a job for life, indeed, they don’t know if they have one for the next year. Outsourcing has become a necessity due to the squeeze on budgets and the failure to discharge people from hospital in a timely way is proof of the pressure that social care is under. This is the manifestation of Conservative ideology. It is a further step in that Virgin will take over the role of contracting for services like Dom care ,carers services, dementia services etc hat were formerly commissioned by L.A. commissioners .Far too much power in the hands of a private company. At least Sirona were not for profit i.e. a community interest company. Bert your information is out of date there has not been a ‘jobs for life mentality’ for years now. Volorgs have to fight for contracts every three years and are vulnerable if they dare to speak out. The whole commissioning system in health and socisl care now is a huge bureaucratic waste of money, you would do better to look at that. A minor point maybe but once his and social care are merged social care will be under the heel of health. If doctor wants you put in a home because you are costing his surgery too much there will be no-one able to speak up for you without fear of the consequences. It is necessary to give private run organisations to manage failing social care sectors perhaps they do not have to rely on agency staff or private project managers who cost much more to keep these department afloat.Someone I know is already hired to work for Virgin care and the feedback from her seems very pleasing. Please note most departments are run by agency staff with a very high turn over of staff from all heirachy. What makes you think Virgin will use fewer agency staff? No-one wants to use agency staff due to cost but have no choice of they cannot attract permanent staff. If as I suspect they start worsening terms and conditions they will be even less able to attracts staff. Unfortunately we are seeing more and more closures of social enterprises that have lost major contracts for health, care and other public services. Lucy Findlay, Managing Director of Social Enterprise Mark CIC, has recently published a blog post about this, looking at the implications of the increasing pressure on commissioners to make huge savings, whatever the long term costs. BNES was already run by a cic called Sirona who lost the contract to Virgin. Small cic s cannot compete in the tendering process with the likes of Virgin, who have made loads of promises a laTrump that I doubt they will be able to keep. As a newly qualified social worker we have always been reminded of the importance of being non-judgemental. I therefore cannot see why we should assume that Mr Branson is a bad person! He has flown balloons around the world and used to own a record shop in London i have been told. That is pretty cool if you ask me! He also has a major stake in various transport companies which if you think of it is very relevant to social work. It is all about the journey and the ultimate destination (i.e. outcome). So come on everyone let us give old beardy a chance and I can’t help thinking that one of the advantages with Virgin social care will be discounted trips to various exotic cultures such as Australia where apparently social workers are still valued. You have got to be joking, or very naive. I had a salutary experience of trying to engage a private provider around values that may be of interest. Our autistic son entered Care after a deep crisis. I tried to make sense of it all by learning as much as I could. One way of doing this was to attend conferences for professionals. The autism charities -Research Autism and Cerebra etc offer subsidised places to parents circa £40. A friend pointed out a conference run by Capita about LAC and ‘legal highs’ and unaccompanied asylum seekers where the great and the good would be speaking to each other. Attendance fees in the order of £400. I contacted the organisers explained my interest and asked if I could have a subsidised place on condition I did’ent eat lunch there. There ‘free places’ apparently had been allocated to the speakers and their friends so they could offer a slightly discounted price but no more. This struck me as an obscenity – the great and the good ( all salaried, paid for by you and I?) speaking to each other at circa £400 a pop and the very people affected excluded by virtue of the ticket price. I wrote to the DfE afterwards and received a reply – ticket prices were a ‘commercial decision’. Really? What about selling ‘legal highs’ where they were legal? Is that a commercial decision? Bear in mind the DfE could have access to as many new schools as they wanted and this conference could have been used to showcase the massive improvement in school buildings over the last 15 years case and provide some income to a local authority. So really what has this to do with Virgin? Well my conclusion was that private companies will always have profit in the DNA and values will always come a poor second. …Puts a different complexion on ‘Good enough for our own families’..could it mean ‘we would sell our grandmothers for profit’? ..Commercial decision after all. Hugely significant moment in health and social care yet no statement or comment from adass! I can’t believe directors of adult social services don’t have a view on these services being taken over by a private company who by definition are in it to make a profit further down the line.